Spotlight, the built-in search tool for your Mac, has undergone a dramatic upgrade with the introduction of OS X Yosemite. In the past, Spotlight was a fairly fast search tool that could find just about anything stored on your Mac, all from the confines of a little menu applet stuck in the right corner of the Mac’s menu bar. Over time, and subsequent releases of OS X and macOS, Spotlight’s capabilities kept growing. It’s now the base application used by your Mac for any type of search performed, including searches within the Finder, most applications, or from the desktop. Starting with OS X Yosemite, Spotlight has a new spot on the desktop. You can still find it in the top right corner of your Mac's menu bar, as well as within Finder windows, but Spotlight has impressive new search capabilities that go well beyond your Mac’s file system. Spotlight now takes center stage when performing its searches. No longer relegated simply to the top right corner, out of the way, Spotlight now opens its search window almost dead center on your Mac’s desktop. What's more, the new Spotlight search window is dynamic, displaying various window sizes depending on the search results. In addition, Spotlight displays results in both a quick overview and a more detailed level, all in response to how you’re using it. Spotlight can be invoked by clicking the spotlight icon (a magnifying glass) located near the top right corner of the Apple menu bar. But the easiest way to use Spotlight is the keyboard shortcut command + spacebar, which lets you open the Spotlight search app without taking your hands off the keyboard. After all, you’re going to be typing in a search phrase, so why use the mouse or trackpad first? No matter how you choose to access Spotlight, the Spotlight entry field will open just slightly above the center of your Mac’s display. As you start typing, Spotlight will attempt to anticipate the phrase, and auto-fill the search field with its best guess. You can also use this auto-fill function as a quick application launcher. Simply start typing the name of an app; Spotlight will complete the app’s name, at which point you can hit the return key and launch the application. This also works for websites. Start to enter a website URL and Spotlight will fill in the site name. Click return, and Safari will launch and take you to the website. If the auto-fill response isn’t correct and you don’t press the return key, after a short pause, Spotlight will present all matches to the text you entered, organized by categories. You can organize the search order using the Spotlight preference pane. So far, aside from having a new display location for its search field and results, Spotlight doesn't appear to have changed much. But looks can be deceiving. Spotlight adds new sources that can be used in a search. Mavericks allowed Spotlight to be used to search Wikipedia. Subsequent versions of Spotlight can search news headlines, the App Store, iTunes, Bing, websites, and maps, as well as, of course, all locations on your Mac, such as applications, documents, movies, mail, and images. Movie searches could stand a little improvement. 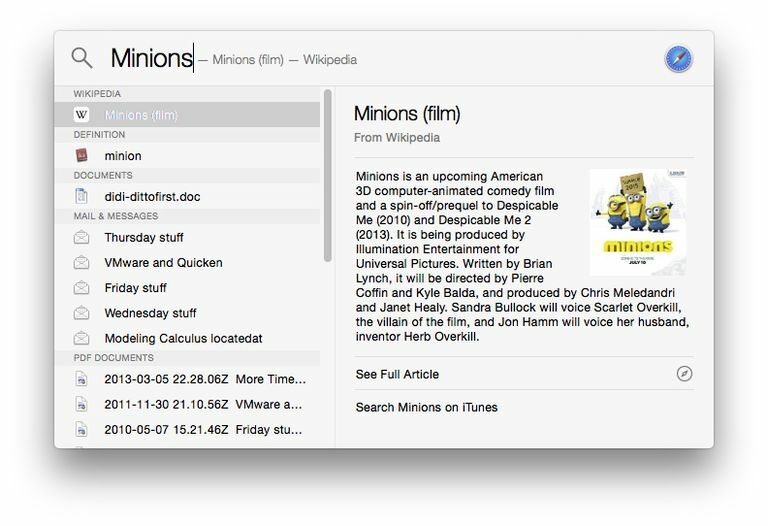 Spotlight will look for movie matches in iTunes and Fandango but lacks direct lookup of movie information from IMDb (though IMDb may show up in the web search section of Spotlight). This works fine if the movie you want information about is current and playing in a nearby theater, for which Fandango provides the information; or if the movie is within the iTunes movie catalog. But if you’re searching for a movie that isn’t playing nearby, or for one of the many movies that Apple hasn’t made available in iTunes, then you’re back to opening your browser and searching like it was 2013. The other change is that you can now quickly scroll through the results of a search, select an item, and display it in a preview, so you can select exactly what you were looking for, without looking through multiple items to find the right one. Selecting a search result item by hitting the return key will open the item with the appropriate app. Examples include opening a spreadsheet in Excel or Numbers, depending on which app created the document and opening a folder in a Finder window. If there is one feature I would like added to Spotlight, it would be the ability to customize the search sources. Perhaps I would rather have information from Duck Duck Go instead of Bing, or maybe Google is my preferred web search engine. It would be nice if those choices were left to me. Likewise searching IMDb would be my preference over Fandango, since I am usually looking for information about a movie, and not if it is playing nearby. The point being, we're all different and a bit of customization on the search sources would go a long way to making Spotlight even more usable for everyone. Spotlight has advanced with each new version of the Mac's operating system. Now that it has taken on search functions beyond your Mac, you may discover that pressing command + space becomes second nature, much like pulling up a browser search page.